Tàu hũ cuốn lá lốt (betel leaf wrapped tofu in Vietnamese) is very similar looking to Greek dolmades. Instead of using grape leaves though, betel leaves serve as the packaging and delivery device for pan-fried tofu and vegetables. Betel leaves have a peppery taste, and when cooked they have the appearance, but not the texture of nori. The tofu mixture is similar to the filling I use for my vegetarian egg rolls. The traditional way to prepare this dish is with extra lean ground beef (see tips), called thịt bò nướng lá lốt. However, Aunt Elise, who is a vegetarian, is visiting from Vietnam and taught me how to make the meatless version of the dish. Either way, it's an exotic and authentic taste of Vietnam. Lulu's aunt, Sara, gave Daddy a betel leaf plant a few months ago. 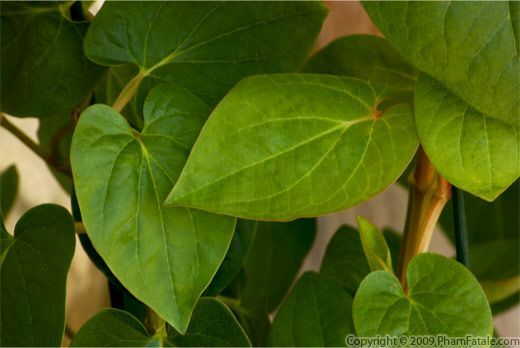 It has grown from a small vine into a prolific producer of fragrant leaves. Daddy loves chewing areca nuts wrapped in a betel leaf. It's very popular in India (paan parag) as well as Vietnam (trầu). In much of Southeast Asia, betel leaves are used to make a salad. For the shredded carrot salad I made today, I decided to use the fresh betel leaves as a serving dish of sorts. To the shredded carrots, I added diced dried apricots and a fresh, thinly shredded kaffir lime leaf. The combination of the ingredients worked very well together. Betel leaves have a peppery taste and the kaffir lime has a nice citrus-y aroma. In keeping with the Asian theme, I made a peanut and tamarind dressing to brighten up the dish and tie all the flavors together.